What Kind of Crackers Do I Serve With Brie? What Kind of Bread for Escargot? What Do You Snack on With Gin and Tonic? What Food Pairs Well With Sangria? The refreshing fruitiness of sangria pairs well with spicy foods. 1 What Kind of Crackers Do I Serve With Brie? 3 What Kind of Bread for Escargot? 4 What Do You Snack on With Gin and Tonic? Fruity, refreshing sangria can be prepared with red or white wine, sparkling or flat, based on what you like best. 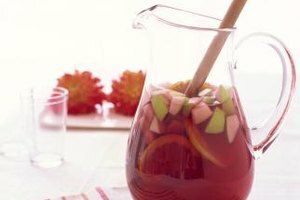 Though its sweetness and summery quality may make it difficult to figure out what to serve with the beverage, sangria pairs well with a variety of foods. Consider the sweetness level of the sangria you've prepared to ensure you don't pair it with a too-sweet dish, as the sugar may become overwhelming. The cool sweetness of sangria plays off of the spiciness of Spanish, Tex-Mex and Thai dishes. Serve a red sangria with a chorizo-based dish, roasted chipotle salsa, stuffed jalapeno peppers or a spicy yellow curry. Pair a white sangria with guacamole, seafood paella or chicken empanadas. Of course, if you prefer red over white sangria, feel free to pair it with whatever spicy dish you like. Add a touch of brandy to your sangria, if your recipe did not already call for it, for an extra kick that balances against spice. Seafood pairs particularly well with sangria, as the citrus fruit in the drink complements the dish. Serve grilled or fried calamari with aioli for dipping. Or, grill or pan-seared, spice-rubbed shrimp to go with your sangria. Scallop-based dishes, lobster, crab and oysters all play nicely off of the wine punch. Fresh white fish, such as haddock or tilapia, goes well with sangria, especially when grilled or baked with a butter crumb topping. Alternatively, try a salad with lightly seared fresh tuna. Like many wines, sangria may be served as an accompaniment to cheese, so go ahead and throw that wine and cheese party. 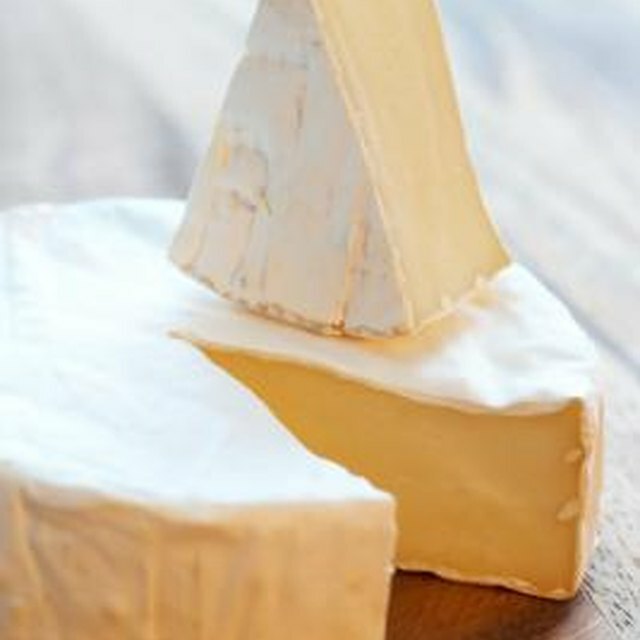 With its rich creaminess but mild flavor, brie pairs particularly well with sangria. Serve the cheese on crackers or crostini with sliced Granny Smith apples. The rich, earthy flavor of goat cheese balances nicely again the fruitiness of sangria. Try a variety that features a strain of ash or is mixed with fresh herbs. Other types of cheese to serve with sangria are aged cheddar, Gouda, Asiago and Camembert. Cold cuts work well with sangria because of their saltiness and smokiness. Put together a board of cured meats to pair with your beverage and other snacks, such as cheese and nuts. Serrano ham, prosciutto and salami are all good options. Terrines and pates offer a rich, fatty balance to the sweetness of the sangria. Serve them with crackers, fruit spread and your choice of white or red sangria. What to Drink With What You Eat; Andrew Dornenburg, et al. Cocktails: 180 Recipes with Delicious Food Pairings; Gianfranco Di Niso, et al. Dallas News: The Perfect Pairing for Fiery Foods? Sangria! Kathryn Roberts has worked in the culinary industry for nearly a decade in various roles, including pastry chef and bakery manager. After studying at the Culinary Institute of America, she earned her BFA from Goddard College and is pursing an MFA in Writing from Vermont College of Fine Arts. What Meat Pairs With Sangria? What Kind of Beer Do I Pair With Greek Food? What Goes With BBQ Ribs? What Meat Goes Well With Boiled Cabbage? Can I Make Sangria From White Zinfandel? What Finger Foods for a Red Wine Tasting Evening?